Off-Beat and Un-Explored Trek "Chowk - Umberwadi - Matheran"
Farms, Hills, Lakes, Climbs, and finally the forest on the summit with pleasant climate.. This less explored trek promises plenty of greenery; landscapes and adventure; it starts at Chowk station; and takes you along the banks Morbe Lake, you cross few stream-lets before reaching Umberwadi Hamlet, from here one has to negotiate steep ascend with exposed slopes, few rickety ladder before you finally reach near Charlotte Lake Matheran, A couple of kilometer further and you can treat yourself with some lavish biryani or Khima Pav or Gujarati Thali at Matheran Market, One has to walk 3 more kms to reach Dasturi Nake from here or ucan hire a Horse Ride from Matheran market till Dasturi to finish the trek in style. Altitude: 2600 feet above mean sea level. Trek Category: Tough (Initial part is easy a plain scenic walk along DAM and lake for almost 2 hours. 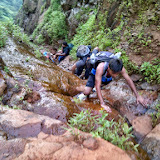 the last 35% of the trek involves few steep and slippery exposed patches; climbing few rickety ladders; the final patch after your climb the Shivaji Ladder is tricky, slippery and steep; and requires good trekking / climbing skills to climb during monsoon. Trek duration 6 hours. Flora and Fauna: Scroll down to the bottom of the page. 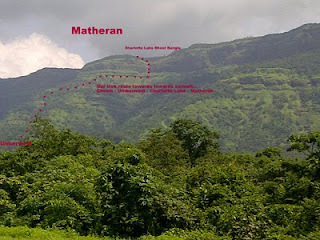 Matheran is situated in the Matheran range of sahyadris at a height of 2516 feet. With more than eight to ten different routes, Matheran (2516 feet) is the ultimate destination for the trekker, naturalist and outdoor enthusiast. It is literally a forest on top of the hill (mathe means head and raan means forest). The dense forest cover, teeming bird life, long walks and flora and fauna make this an all-time favourite. The best part is that it's pollution-free as no vehicles are allowed in the hill station. Apart from Bhimashankar, Matheran is the only other place where the giant red squirrel is to be found. It's also a haven for snakes, from the harmless keelbacks and pythons to the more deadly members of the clan such as cobras, kraits and vipers. While trekking up to matheran hills after Ambewadi, you will come across a mass of boulders and rocks into which the trail disappears. This is known as Shivaji Steps or the Shivaji Ladder. According to local legend, Shivaji rode up this route on horseback. From here, it's 500m to the top, up a stream bed that's dry except during the monsoon. From here Big Chowk Point is clearly visible and looks like an elephant' head. Biodiversity: Matheran is undulating hill top covered with full of beauty. The journey involves an adventurous two hours ascent from Neral in a delightful little toy train or by car; with the panoramic view of the plains as the train chugs uphill towards Matheran.